Ujjain is literally the crossroad of Space and Time in India. This renowned and ancient city is famous for spiritual as well as scientific reasons. It has stood, quite literally, at the very centre of the development of astronomy as a science, as well as an instrument of spiritual knowledge and practice. It is the cradle of the Hindu science of astronomy and Timekeeping, and the principal seat of astronomical knowledge during its early history. It occupied this position because it is situated where India’s ancient Prime Meridian and the Tropic of Cancer once crossed. One of the earliest available texts on Indian astronomy, the Surya Siddhanta, is dated to the 4th century CE. This ancient work explains with complete clarity that the earth is a sphere. It describes many of the scientific methods used for the determination of place and time with respect to India’s ancient Prime Meridian. From the text it is clear these methods were already thousands of years old at the time of its composition. 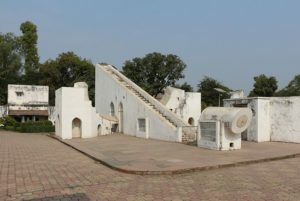 Indicating the great age of India’s zero longitude, or Prime Meridian, of Avanti, the ancient name for the historic city of Ujjain 23°10’58”N & 75°46’38”E. A Prime Meridian is an imaginary line drawn between the North and South Pole. A Prime Meridian is a meridian in a geographical coordinate system at which longitude is defined to be 0°. Together, a prime meridian and its antemeridian form a great circle. It is a zero point for both time and geographical calculations. Today the internationally accepted Prime Meridian runs through Greenwich, in England. In India this line was always drawn through Ujjain. This is stated in all ancient texts on astronomy, as well as in the epics Mahabharata and Ramayana etc. 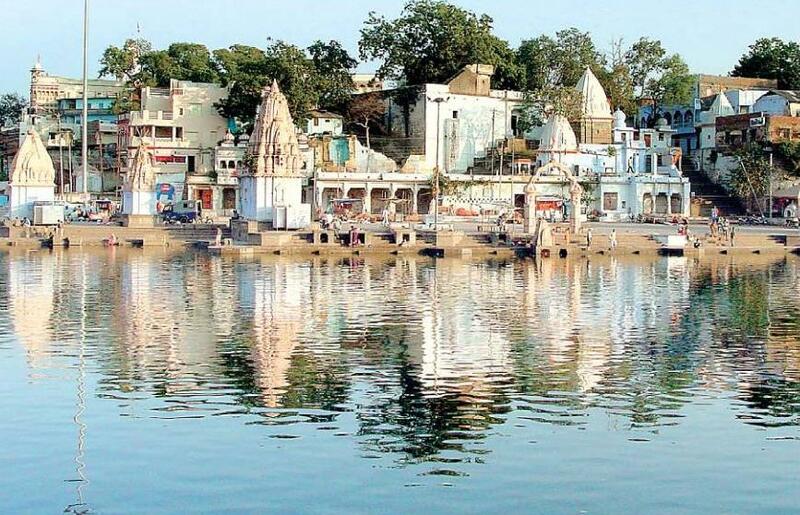 It is what made Ujjain a very sacred city. Dedicated especially to Sacred Time. The main Shiva temple here is dedicated to Mahakala, Great Time. All Indian traditional calendars and all sacred time is calculated from this line. It is also the basis for geographical calculations. Because of its status as the centre for all astronomical and geodetical calculations, Ujjain attracted many religious and scientific institutions. Many of its temples are in some way connected to Time and Space. In the 18th century one of the still existing observatories for astronomy was build here by Maharaja Jai Singh II in 1725. Known as the Vedh Shala or Jantar Mantar it consists of 13 architectural astronomy instruments that measure many astronomical phenomena with great accuracy. Once in 12 years Ujjain is the location for one of India’s greatest religious festivals. It is the Kumbhamela of Simhastha. 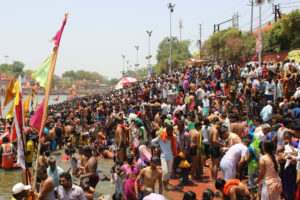 Ujjain is one of the four places where a drop of Amrita fell after the Samudra Manthana, the Churning of the Cosmic Ocean by the Gods and Titans. When the Sun is in Mesha/Aries and Jupiter in Simha/Leo the Amrita, Elixer of Life, materialises in the river Kshipra. It is a very sacred time when a soul can purify itself. The last time this festival was celebrated was in 2016. There is another important astronomical line connected to Ujjain. But this is kind of controversial. 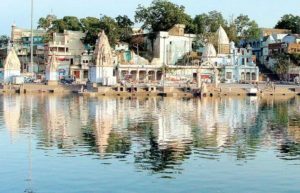 Traditionally the Tropic of Cancer is also thought to pass through Ujjain, specifically through the temple known as Karkoteshwar, located within the compound of the Harsiddhi Temple in Ujjain. The Tropic of Cancer is the line of the most Northern position of the Sun is his yearly course. From mid-winter till mid-summer the Sun’s course is north. In India this is called Utarayana. 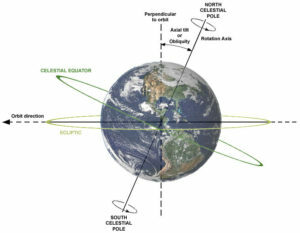 Between mid-summer and mid-winter the Sun moves south, called Dakshinaya. These are not real but apparent movements caused by the tilt of the earth’s axis. It is the cause of the seasons on our planet. Here we run into a mystery, a challenge even. Because in actual physical reality the Tropic of Cancer does not cross the Karkoteshvara temple in Ujjain in our time. 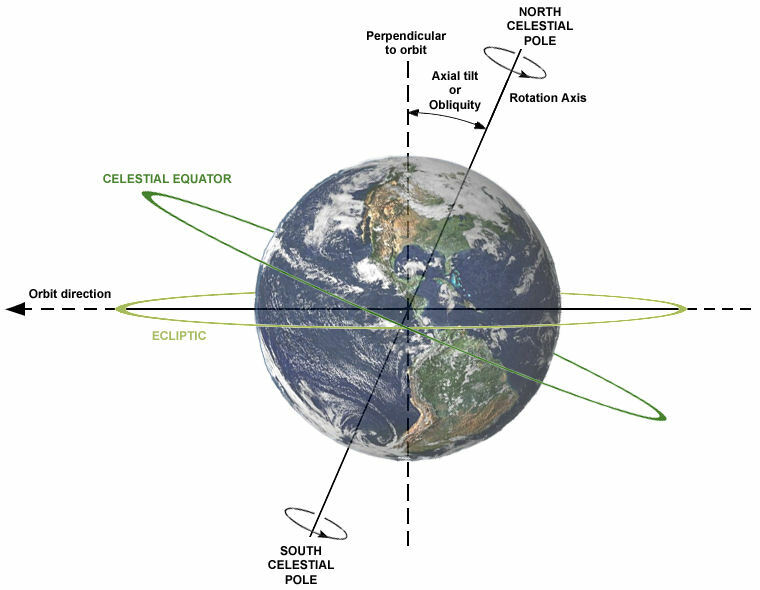 The Earth’s axial tilt (obliquity) is currently about 23.4°, and therefore this line runs at the latitude of 23°26′13.4″. Does this mean the ancient Indian astronomers made a big mistake? Or could this apparent error be explained somehow. I think it can be explained, but the explanation leads us right into another mystery. 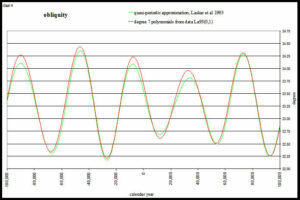 Graph of the oscillation of the earth axial tilt. A cycle of approximately 41.000 years. 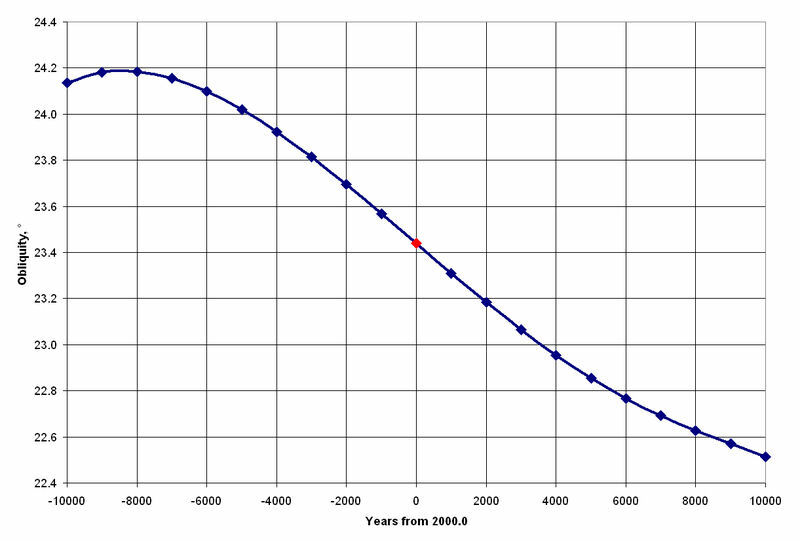 Because Earth’s obliquity oscillates between 22.1 and 24.5 degrees on a 41,000-year cycle (See illustration). At the moment the Tropic of Cancer is on its way back South and will cross through Ujjain approximately in 4250 AD. Last time the Tropic of Cancer crossed the site of Ujjain was some 20.000 years ago. Which leaves us with this mystery: did Ujjain already exist as an astronomical centre in these remote times and was Indian astronomical knowledge already so highly developed in what it considered pre-historic times? When humanity is thought to have lived only as primitive hunter gatherers? 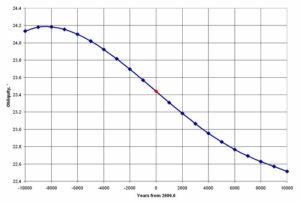 Graph of the shift of the Tropics. Did the sages of old actually observe the Tropic of Cancer when it was crossing through Ujjain? Or is the identification of Ujjain as the crossing point of Prime Meridian and Tropic of Summer Solstice the outcome of assumption and error on the part of the ancient Indian astronomers? 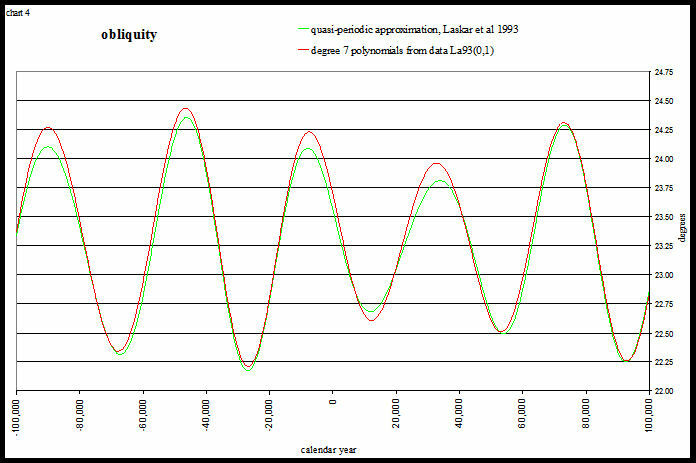 The standard academic approach of this kind of anomalous data is to ignore it as the outcome of errors from the part. Prehistoric people are assumed to have been ignorant and kind of stupid. But there is a sea of evidence of the contrary. Vedic texts and ritual are full of astronomical data and geometrical knowledge in the form of symbolic codes, and as part of myth and ritual. The Vedic rituals were ruled by a sophisticated calendar. And India can be proud of a great number of astronomers and mathematicians who achieved detailed understanding of these sciences in early historic times. Our standard understanding of humanity’s prehistory is full of preconceptions. Many of these are being challenged. Does the location of Ujjain point to the existence of advanced astronomical knowledge in India in those very far off times, some 20.000 years ago? That indeed would challenge our conventional thinking. But is it impossible? PL get in touch with Nilesh Nilkanth Oak, author who has postulated dates for Ramayana and Mahabharata based on astronomical data. Thanks, I had notice his work already and have connected to him. I LIKE THE EFFORTS MADE HERE. Great work. Ours was a rich tradition and restoring these facts is a great service .